While on a birding tour with some folks from California we visited the Volcán Lakes on February 20th, 2009. Some of the highlights seen were the Chiriquí (Masked) Yellowthroat and Wilson's Snipe, among other goodies. 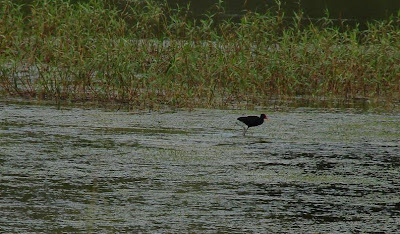 Of greatest surprise to us while scanning the lakes was a Wattled Jacana amongst the more abundant Northern Jacanas. 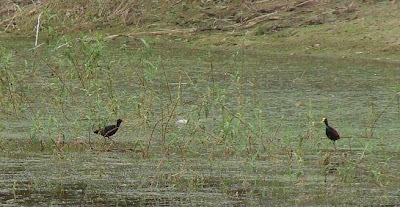 The Wattled Jacana despite being at a disadvantage was very aggressive towards the local ones. See attached pictures taken by Bob Rogers.